Learn how to sew a fabric book to showcase your favorite fabric prints. I used my favorite Liberty Art Fabrics in this tutorial with the exception of the quilting cotton used for part of the cover and to make the pages. This is part 1 of the 3 part tutorial. Part 2 covers how to make the pages inside the book. I wanted the theme of my book to center around Valentine’s Day but you can create any scene of your pleasing. If you’re a quilter try tiny quilt blocks or if you like sewing clothing, create them in miniature using different fabrics. The possibilities are endless! For each page, cut 2 pieces of white quilting cotton the size of your book cover and add 1/2″ seam on each side for allowances, i.e. if your final book size is 10″ x 10″ cut 2 pieces of fabric 11″ by 11″. Another option is to cut your fabric double the width ( i.e. 11″ x 22″ ) so you can create 2 pages using 2 pieces of fabric instead of 4. This allows you to fold your page in half so you end up with 5″ x 5″ on each side after sewing in the seam allowances. I wanted the option to customize each page and bind them separately so I didn’t go this route. For the page you will be sewing the Liberty fabric onto, use a disappearing fabric ink pen or FriXion pen like I did to mark the final size of the page after the seams are sewn. 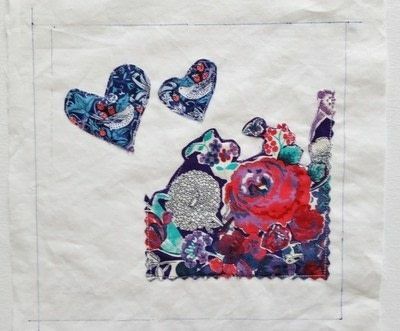 You want to make sure the Liberty fabric does not get encased in the seam allowances. Use pen and paper to draft templates of your shape onto paper and cut out. Do a test fit using the paper templates to make sure they will all fit in the rectangle you marked with your pen. Then trace the shapes onto your Liberty fabric and cut them out. I used glue stick to adhere my fabric shapes to the quilting cotton first and then stitched around the edges. There are endless options you can create for your pages. For this page here, I cut the floral motif from Childhood Treasures. I used pinking shears on the edges to prevent fraying but it’s totally optional. 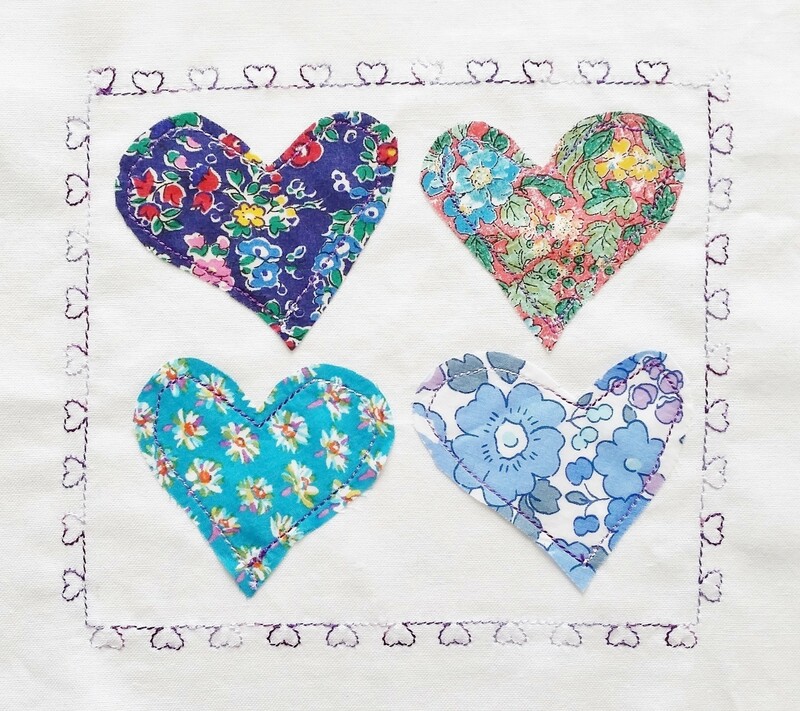 The hearts were cut from Strawberry Thief designed by William Morris. I love the color combinations of purple, red, and blue. For the back part of the page , I ironed on Pellon Craft-Fuse 808 interfacing to my quilting cotton. Then I put the pages right sides together and sewed around using a 1/2″ seam allowance leaving a 2 inch gap. I made sure the gap faced the left side where the pages would eventually be bound together. This is the same method I used to sew the cover detailed in my part 1 tutorial. 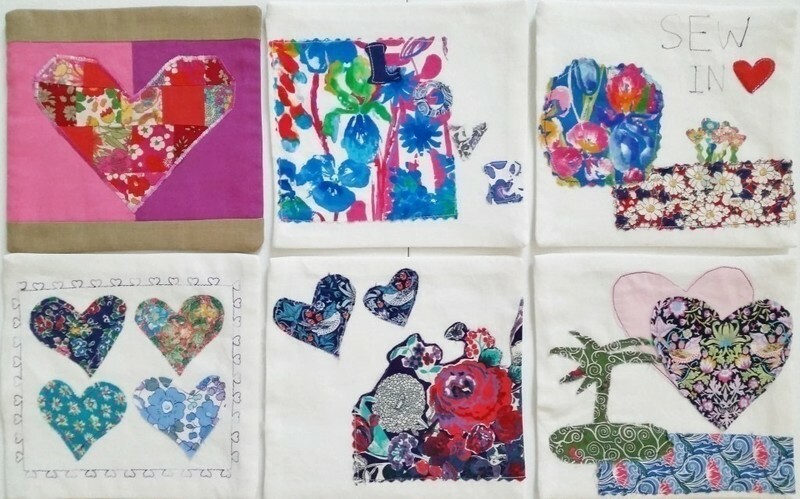 Since the back of each page is blank another optional step is to use fabric glue or to stitch tiny swatches of fabric to make a collage if you want to showcase more of your Liberty fabric.